King Scrydan and his royal court will arrive in Beeville on Friday, Nov. 19 for a two-night presentation during the Madrigal Feast. The Coastal Bend College Community Performing Arts Project and the Beeville Community Chorus will present the third annual event starting at 6 p.m. in the James R. Dougherty Student Union Building. Tickets are now on sale in the CBC Theater Box Office from 10 a.m.to 6 p.m. Monday through Thursday. Tickets are $25 for all adults and $20 for students and children. A four-course meal will be served during the evening as members of the cast and the choir take you to the sixteenth-century English court of King Scrydan. The word madrigal refers to a non-religious song developed during the Renaissance period. The madrigal is a song usually for four to eight voices and has a text dealing with love and/or nature. The castles and royal courts of the time held madrigal feasts during holiday seasons and sang madrigal songs while feasting. 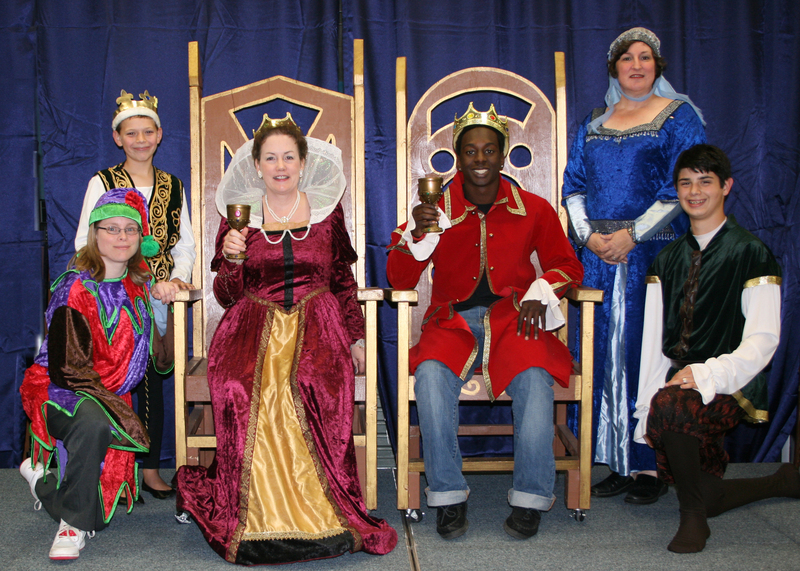 Members of the cast are as follows: Towncrier, Benjamin Brewer; Jester, Kathleen Chambliss; Fiona, Sally Friedlander; King Scrydan, Monzelle White; Queen Scrydan, Dr. Nancy Jones; Duchess of Earl, Cindy Hilliard; Marley, Dr. Cheryl Clarke; Interpreter, Thomas Brewer; Christmas Past, Stacy Stevenson; Queen Mum, Clarissa Garcia; Young King Scrydan, Cullen Hughes; Beggar, Daphne Garcia; Christmas Present, Yvonne Alaniz; Christmas Future, Stacy Stevenson; Holly, Rosemarie Stafford; Ivy, Leah Brewer; Courtiers, Carolyn Hamrick, Reverend Jerry Huckman, Matthew Huckman and Linda Ray. While not required, nobles in the audience (all those attending the feast) are invited to come in their Renaissance costumes. Come and join the fun as the cast presents this year’s madrigal play, Scrooge, Marley and Me. Call (361) 354-2545 or go online to www.coastalbend.edu to purchase tickets. Tickets for the Friday performance will not be available after noon on Wednesday, Nov. 17. Tickets for the Saturday performance will not be available after noon on Thursday. No tickets will be sold at the door. For more information call Dr. Jim Lee at 354-2303 or email at jlee@coastalbend.edu.